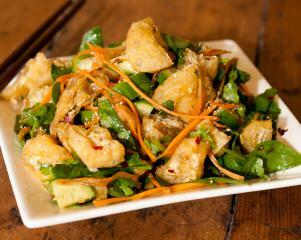 Warm Thai Tofu Puff Salad. This is my version of the thai warm beef salad. Salad stuff like coarsly grated carrot, cucumber, paw paw, finely chopped lettuce, baby spinach and bean sprouts. In a wok toast the rice on a medium heat. When the rice is browned remove from the wok and grind in a mortar and pestle. Slice the tofu puffs into bite size pieces and dry fry in the wok until warmed through. Add all the dressing ingredients and toasted rice together in a jar and shake well. Toss all the ingredients and dressing in a bowl and serve.